Congratulations to our newly elected Executive Board members! We are looking forward to an exciting season in the spring. We are also excited to welcome Richard Cole as our new head coach! We also wish the best for Chelsea Klein who has stepped down as head coach, but continues to assist the team and offer support as the adviser. WFRC had a wonderful time competing at the Head of the South regatta! All our boats demonstrated a strong performance, especially our VM1x [Silver] and Mixed N2x [Bronze], who walked away with medals! 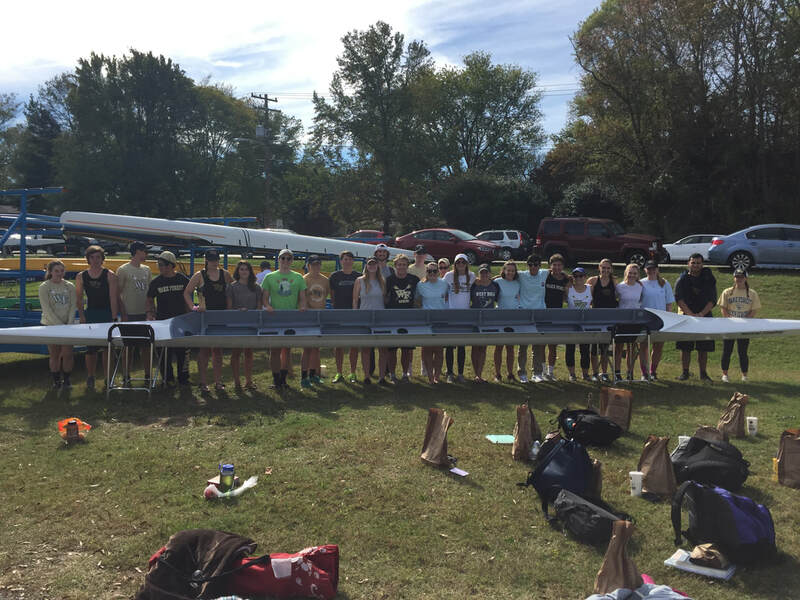 Wake Forest Crew had a wonderful and successful Saturday at Secret City Head Race! After this competition, we had four boats medal! VM1x [Silver], VM4+ [Silver], NM4+ [Bronze], and NW4+ [Bronze]. Maintaining this level of success, we look forward to competing at Head of the South early November. 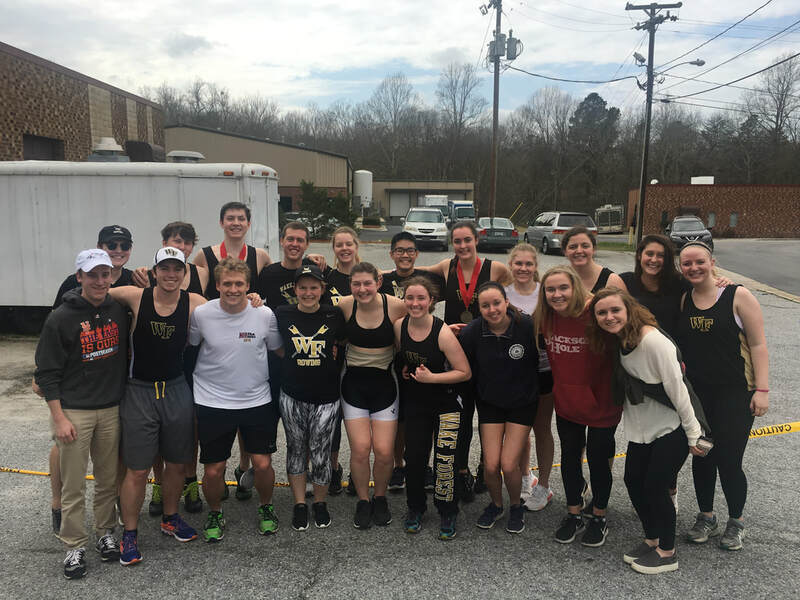 Wake Forest Rowing Club's varsity members competed in their first regatta of the 5K season and had great success! The VW4+ and VM1x earned third place finishes, while the VM4+ left with a fourth place finish. Moving forward, we are excited to continue working hard and are looking forward to improving at our next two regattas! The weekend of April 20-21 the team competed in the SIRA Championship Regatta in Oak Ridge, TN. In two days we had five boats compete in a total of 13 races. The team had a terrific showing to end the season! Saturday, April 21st: Starting with time trials in the morning everyone had a solid start to place into semi-finals or finals. The NW4+, NM4+, and VW4+ placed into semi-finals to determine their finals for Sunday. Congrats to the NW2x and VM4+ for advancing placing 3rd in their finals! Sunday, April 22nd: After semi-finals the NW4+, NM4+, and VW4+ were ready to take on finals. The NW4+ placed 5th in the B final, NM4+ placed 2nd in the C final, and the VW4+ adanced to place 4th in B finals. A huge congrats to everyone on the team for a great season! Saturday, April 7th, the team competed in Clemson Sprints hosted at the beautiful Lake Hartwell on Clemson University's campus. It was a great weekend for everyone as we had multiple boats make finals! After a switch up from John Hunter, we had lots of new boats/lineups on the water for Clemson: VM4+, VW4+, NW2x (MW2x), NW4+, NM4+, and a mixed 8+. Huge congrats to the VM4+, NW4+, and NM4+ as they all made finals! And a special shoutout to the NM4+ for finishing SECOND in finals! Our mixed 8+ of varsity/novice members continued tradition and placed SECOND! Overall a great showing from everyone with plenty of motivation to push on to SIRAs in two weeks. On Saturday, March 24th, the team travelled to Gainesville, Georgia to compete against fellow collegiate club teams in the annual John Hunter Regatta. It was held at Lake Lanier, in the complex where the 1996 Atlanta Olympic Games were held. We had four boats compete, VM8+, NW4+, VM4+, and VW4+. A huge congrats to the women's Novice 4+ for placing FIRST in their race with a time of 8:26:76 and the men's varsity 8+ for making Petite Finals. A strong showing from everyone and a great weekend spent in Georgia! ​Help send us to SIRAs! On Saturday, February 24th, the team traveled to Jamestown, NC to compete in Erg sprints hosted by the High Point Rowing Club. The team had a strong showing, with PRs from multiple members on all squads and ending the day with three medalists. Two novices and Coach EJ clinched a medal in their events to cap off a great day of racing. We look forward to John Hunter after Spring Break. Go Deacs! On November 11th the team traveled to Augusta, Georgia to compete in Head of the South. This was a great way to end the Fall Season and head into Winter Training. We had boats compete in the NW8+, NM4+, NM2x, VW2x, VM4+, and VM4x categories, racing 5000 meter races. It was a successful day of rowing all around. We look forward to improving during Winter Training as we move into the Spring 2k season. On Saturday, October 28 we hosted our annual Family Weekend Brunch in the barn. 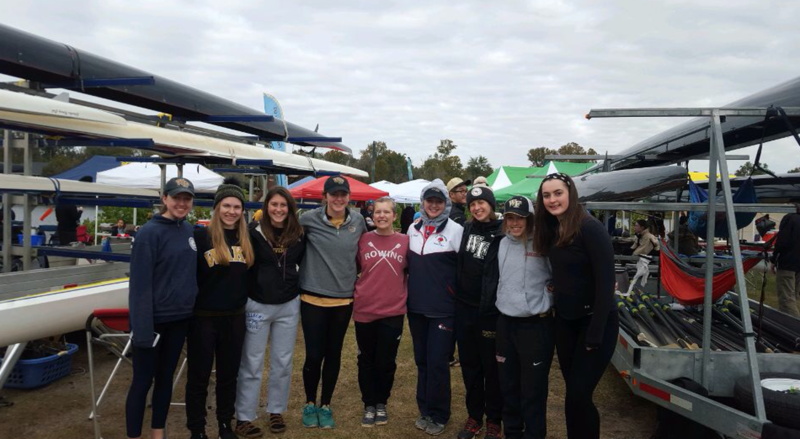 We would like to thank all of the parents and families who were able to attend this event, as it is a very important tradition for the Wake Forest Rowing Team. 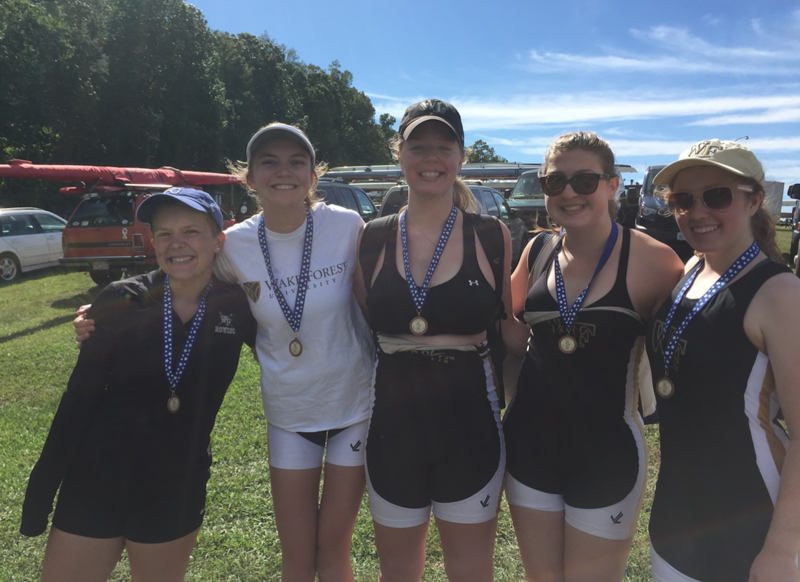 This past weekend on September 30th, our Varsity squads traveled to High Point to compete in their first regatta of the season! Both of our Varsity 4s did a great job and our Varsity Women pulled away with 3rd place medals! The Varsity Women's 4+ finished with a time of 19:35.25 and the Varsity Men's 4+ finished with a time of 18:27.47. WFRC was out running for Hit The Bricks and raising money for the Brian Piccolo Cancer Research Fund all day on Thursday, September 28. In total the event raised over $74,000 to help fight cancer. 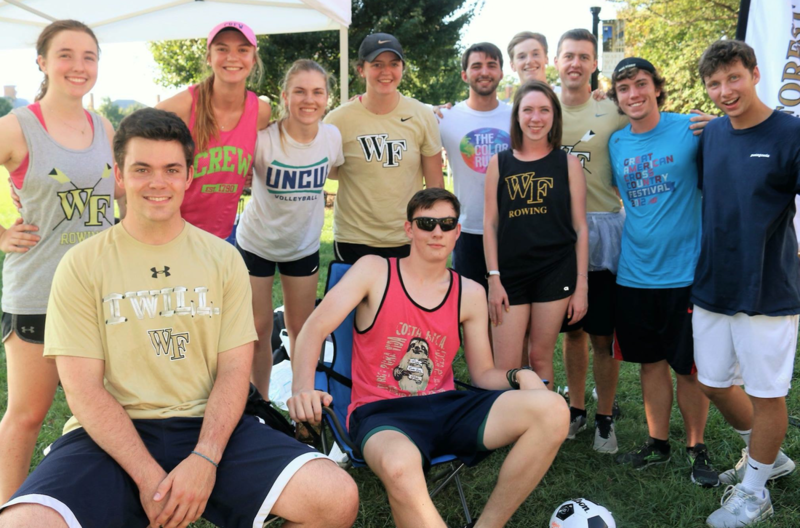 Keep up the good work Deacs!